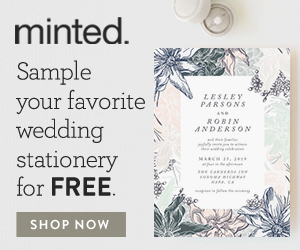 These beautiful floral rustic invitations feature white flowers, leaves and typography on your choice of colored background. The floral design can be foil-pressed. Trim Options: Straight Edge, Waved Frame, Bubble Scallop, Classic Frame, Rounded Corners, Tag, Curved Frame. Back Options: White, solid color, floral pattern, text or photos. Address Printing: Guest addresses can be printed directly onto the envelopes. This option is free for a limited time. Return address can be printed on the back flap. 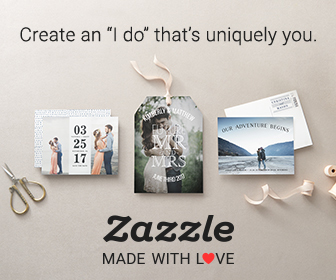 You can purchase matching personalized postage stamps. I think these invitations are elegant. I like the white typography and the simple 2 color palettes. For a handmade touch you could add some rhinestones to the center of the flowers and tie a white ribbon around your stationery suite before posting. These floral rustic wedding invitations have been designed by Katherine Watson.